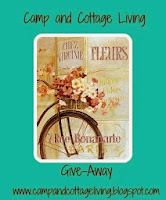 Kimberly at Camp and Cottage Living is having a heck of a give-away. She is giving away an incredible bracelet made out of vintage silverware! If you haven't seen it, go by and take a look. Simply beautiful. Oh, and you can enter the giveaway while you're there! In addition to the bracelet, she has some other goodies that the lucky winner will also receive. Thank you, Mary, for sharing my give-away.